The sport of baseball is in itself, romantic. Fans pile into stadiums to escape from the real world and watch America’s past time. This means getting to watch a gorgeous sunset over center-field wall, see tomorrow’s up-and-coming baseball stars and compete in spam carving contests. You can’t make that up. While Minor League Baseball is known for its greatness on the field, it’s becoming quickly known more for its “greatness” OFF the field. And I’m by no means complaining. Where else could I go to get a free Noah (Yes, the Bible Noah) bobblehead (Hickory Crawdads) or register to win a pre-planned funeral prize pack (Hagerstown Suns)? It’s now become the genius, or lack thereof, behind nightly promotions that have driven ball clubs to sell tickets. Whether it be human-organ colored jerseys (Memphis Redbirds) or Britney Spears Baby Safety Night (Newark Bears), Minor League Baseball is known to have the most outlandish promotions. And here at The Lab, we think we’ve found 10 of the strangest, most bizarre, you-actually-have-fun-at-but-don’t-want-to-admit-it-to-your-friends themed promotions in all of Minor League Baseball. 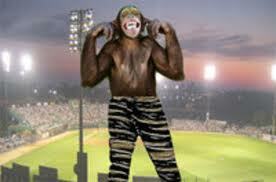 With ideas like this, you can’t put a price on the entertainment value at the ballpark. Not only are fans given nine innings of the greatest sport in the world, they may also be in for a “terribly awesome” night of promotions. So grab yourself a hot dog, sit back, relax and enjoy the magic of Minor League Baseball. Unless of course you’re at the Charleston RiverDogs and find yourself locked out. Call it an early birthday present for Russ Mitchell, who turns 27 on February 15. After being placed on assignment last Monday, the Los Angeles Dodgers utility infielder has cleared waivers and will return to the Dodgers Organization in 2012. The reigning defensive player of the year for Triple-A Albuquerque will be invited to camp to compete for a roster spot with LAD, but has been outrighted to the Isotopes as of this week. Mitchell, 26, was not claimed on waivers by any of the 30 MLB clubs during the two business day signing period. He will remain on the roster list for now, and likely will serve as depth for the Dodgers while beginning a third consecutive stint with the Isotopes. Mitchell’s 2011 season ended with wrist surgery on September 27 to repair torn cartilage, and he is still progressing towards a full recovery. Fans most commonly know Mitchell as an all-around utility fielder for the Albuquerque Isotopes. In 92 games last season with the ‘Topes, he made appearances at first, third, left and right, recording 22 errorless games at first base. Overall, Mitchell committed only seven errors in 352 defensive chances during the 2011 campaign. The nine-season veteran has also begun developing his catching skills to increase his versatility for the Dodgers. At the plate, Mitchell posted a very unique stat line for Los Angeles in 2011, making 43 outs in 58 at-bats, but smacking four homeruns with his 15 hits. At the Triple-A level, he hit .315 and .283 in 2010 and 2011 respectively, slugging over .500 in both seasons. Mitchell currently holds Isotopes batting records for most runs scored in a game (4), most walks in a game (6) and most consecutive at-bats with a hit (8). With increased plate discipline, an even wider skill set in the field and a little luck, Russ Mitchell may see more and more time at the major league level. And while Isotopes fans would hate to see him go, it seems a safe bet to know exactly what Mitchell will be wishing for Wednesday. On Monday the Los Angeles Dodgers designated infielder Russ Mitchell for assignment in accordance with the 40-man roster limit. This move was processed to free up space for newly acquired pitcher Todd Coffey. Mitchell’s status remains on waivers, and if no team shows interest in the infielder within two business days, he can return to the Dodgers, most likely being outrighted to the Isotopes. Mitchell, 26, split time between the Dodgers and Triple-A affiliate Albuquerque Isotopes last season. The utility fielder hit .283 with 16 home runs in 336 at-bats with the ‘Topes, and appeared in 25 games with the Dodgers collecting eight hits and three RBI. In 40 career games at the Major League level, Mitchell has hit .151 in 93 at-bats. Russ Mitchell’s standout moment occurred on May 20, 2011 with Los Angeles playing the first of a three game interleague series against the Chicago White Sox. Later dubbed “The Fog Game,” the Dodgers trailed the White Sox 2-3 in the 9th inning. Mitchell, who was penciled in the roster because of infield injuries, smashed a two-out, solo home run to tie the game. He again proved clutch in the 10th inning with a full-extension, diving snag at third base to prevent the game-winning runs from scoring. The Dodgers eventually went on to defeat the White Sox in a 6-4 final, largely due to the late-inning heroics of Russ Mitchell. Still remaining on the 40-man roster are second baseman Ivan De Jesus Jr. and pitcher Ramon Troncoso. De Jesus spent the majority of the 2011 season with the Isotopes, hitting .310 with 29 extra-base hits and 59 RBI in 387 at-bats. The 24-year-old also proved a consistent glove in the field with a .989 fielding percentage with only four errors. Troncoso, 28, went 2-4 with a 5.05 ERA in 57 innings of work with the Isotopes in 2011, and posted a 6.75 ERA in 22.2 innings with the Dodgers. De Jesus and Troncoso will be competing throughout Spring Training for a spot on Los Angeles’ final 25-man roster. Pitchers and catchers are set to report on February 19 and full squads on February 24. The exhibition games are scheduled from March 6 – April 1 at Camelback Ranch in Glendale, Ariz.